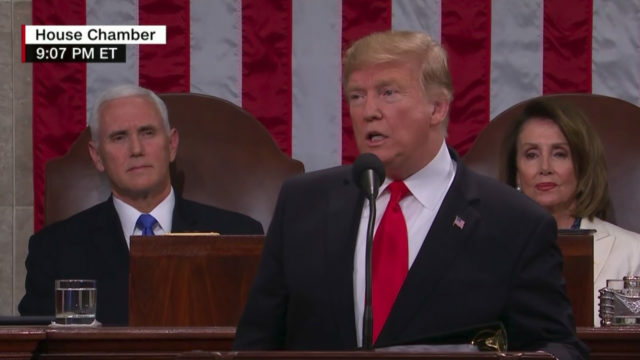 President Trump called for a bipartisan approach to solving America’s problems on Tuesday, but also doubled down on his call for a border wall, citing San Diego as a successful example. Trump cited economic growth, new jobs, low unemployment — especially for minorities — cutting regulations, rebuilding the military and boosting energy production as his administration’s achievements. Trump cited the 20-mile-long, originally makeshift wall in San Diego as an example of why walls work. “San Diego used to have the most illegals crossing in our country. This powerful barrier almost completely eliminated crossing,” he said. He described his desired wall as a see-through steel barrier, not “just a concrete wall.” But he did not call for an emergency declaration to divert funds from the military to erect it. Trump, who has married two immigrant women, his third wife Melania and his first wife Ivana, said he is not opposed to immigration. Trump also called for passage of his U.S.-Mexico-Canada Agreement, the successor to the North American Free Trade Agreement, and promised to promote “fair trade” in all of America’s economic relationships.